Crimespree Magazine #58 Now Available! Crimespree Magazine — Issue 58 is now available! 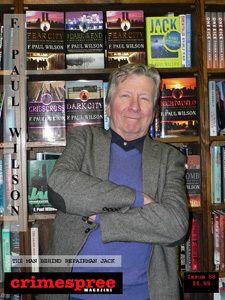 • Bryan VanMeter interviews F. Paul Wilson in this issue’s cover feature. Elise Cooper provides three Q&As with Charles Todd, Sophia Hanna and Terry Hayes. And Dan Malmon catches up with Duane Swierczynski and Alex Segura. • Issue 58 delivers three pieces of fiction this go around: Patrick Shawn Bagley, Stephen Coutler and Steve McQuiggen. The Footprint piece is an interview from 2002 with Barbara Seranella by Jon Jordan. Jon also wrote an article on Dean Kootz’ Odd Thomas series as well as a cool look at Nero Wolfe from A&E. • And the usual suspects are included for your enjoyment: Reed Farrel Coleman, Craig McDonald and Ayo Onatade. Also, Buzzbin, Book Reviews, Crimespree on Comics and Cooking with Crimespree — one by Catriona MacPherson and another by Harry Hunsicker — appear as well.